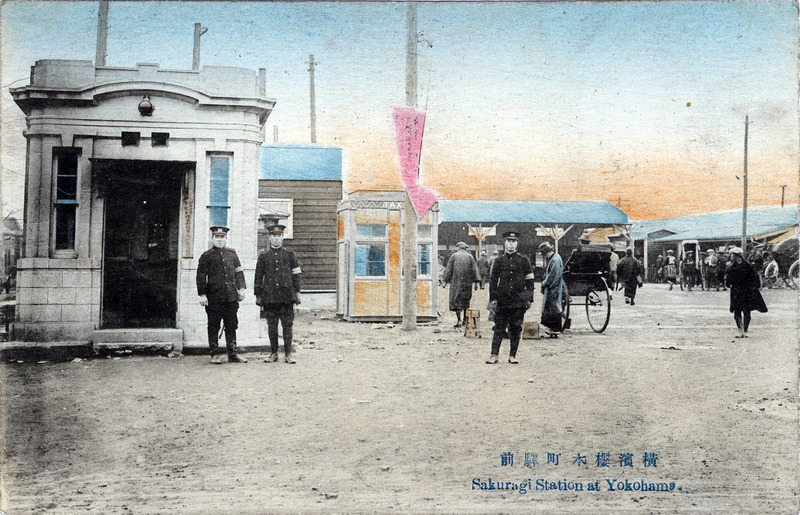 Police box (koban) at Sakuragicho Station, Yokohama, c. 1910. The name koban derives from the name of the earliest structures built in 1874, which were simply boxes meant for standing watch (立番 tachiban) in rotation (交替 kōtai), thus creating a compound word consisting of kō (交) and ban (番). The koban system replaced the earlier feudal era practice of jishiban which were concentrated at intersections along the main highways and large roads leading to Edo, and of the urban okapikki and meakashi who were actually feudal gangsters hired for protection by local neighborhoods. “The system of chuzaisho [residential police-boxes] and koban [police-box, lit. ‘alternating watch’] was begun at the suggestion of a foreigner. “A captain of the Berlin Metropolitan Police, Heinrich Friedrich Wilhelm Hohn, served as an advisor to the Home Ministry from 1885 to 1891. He toured Japan eight times and recommended the establishment of police residences throughout the country. Accordingly, in 1888, the Home Ministry ordered the police divided into two types: indoor-duty (naikin) and outdoor-duty (gaikin) police.